The first short trailer video of Forza Motorsport 5 that debuted last week only showed us two of the cars but this new clip from E3 offers a look at an expanded list of supercars that will grace the tracks of FM5. Joining the McLaren F1 and McLaren P1 from the first clip are the Ferrari F12 Berlinetta, the Pagani Huayra, the Aston Martin Vanquish, the Audi R8, the McLaren MP4 12C, the Lamborghini Aventador and the Koenigsegg Agera. Along with the same P1 from the first trailer, these seven supercars soar through a street circuit in Prague with incredible detail in the historic city surroundings and the cars alike. This 1 minute and 25 second Forza Motorsport 5 trailer video is comprised entirely of in-game video footage although it looks more like a very elaborately shot video of what would likely be the most incredible race ever run. From the movement of the cars relative to the surroundings to the articulation of the suspension as the tires move in the well openings – FM5 will almost certainly be the best looking driving simulation game ever. The new Forza takes that amazing gameplay and those astonishing graphics – adding in “hundreds of cars” and a long list of famous tracks from around the world to create a game that will likely become the standard by which all other racing simulators are compared. While the internet has been abuzz over the past week with the lively dispute whether the Xbox One or Playstation 4 will be the better system – there is no question that Forza Motorsport 5 will step out as the leading driving game in the American video game industry. Even though the 6th edition of the Gran Turismo series has also been announced, Polyphony Digital (the makers of the Gran Turismo games) opted to introduce the game for the current Playstation 3 console. We can expect a similar offering for the Playstation 4 system when it arrives but considering that Forza Motorsport 5 was designed specifically with the capabilities of the Xbox One in mind – GT6 is going to have a very hard time topping FM5 in terms of overall quality. A first for Forza Motorsport 5 will be the introduction of open wheel race cars including (but possibly not limited to) the modern IndyCar Series racers. Turn 10 has introduced a video showing off the new SunDrop/DHL Chevrolet Indy Car and while this video doesn’t show any open wheel racing action – this short clip provides us with another brief glimpse at the stunning graphics of the newest Forza game. 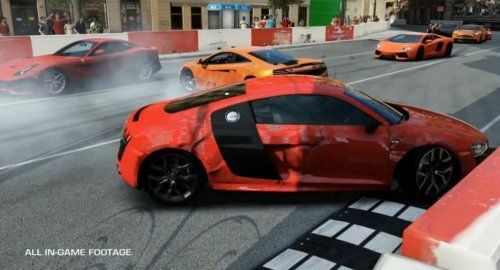 It has also been announced that Forza Motorsport 5 will bring back the Forzavista mode that was introduced for Forza Motorsport 4. This ultra high resolution walk around mode offers gamers a chance to get an up close and personal look at the exterior and interior of the cars of Forza and while FM4 only included a small collection of vehicles in Vista mode – FM5 is said to include every single vehicle in the Vista mode.